My first chocolate ganache was made with a name brand of chocolate chips, ahem morsels, and was nice but not great. Ganache is all about the chocolate and the better quality the chocolate, the tastier your macarons will be. I’ve also learned that some people are either lactose intolerant, or they want to sell their macarons but can’t use any dairy products in the ganache. 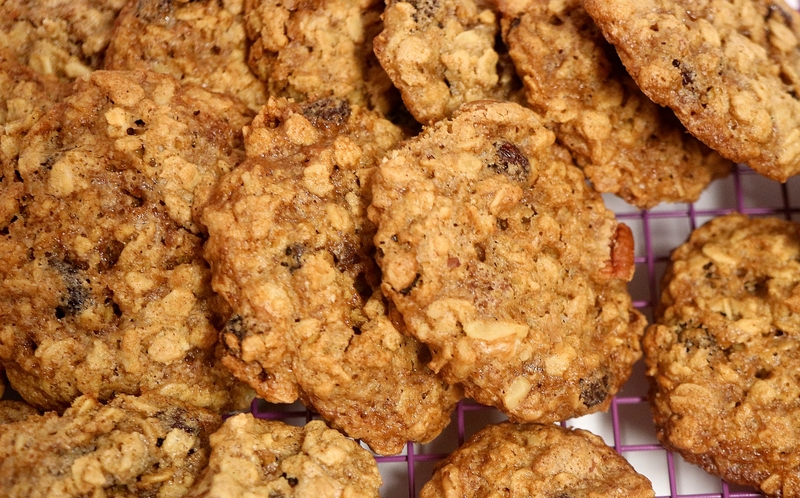 So, here’s a solution to that – a recipe that contains vegan and non-dairy ingredients. Chocolate and coconut are very compatible flavors and this is one of my favorite ganache recipes. This original recipe is from the book Baking Macarons: The Swiss Meringue Method. Before opening the can of coconut milk, shake well. Place in a microwave-safe container. Heat until just starting to simmer, approximately one minute. Pour over chocolate. 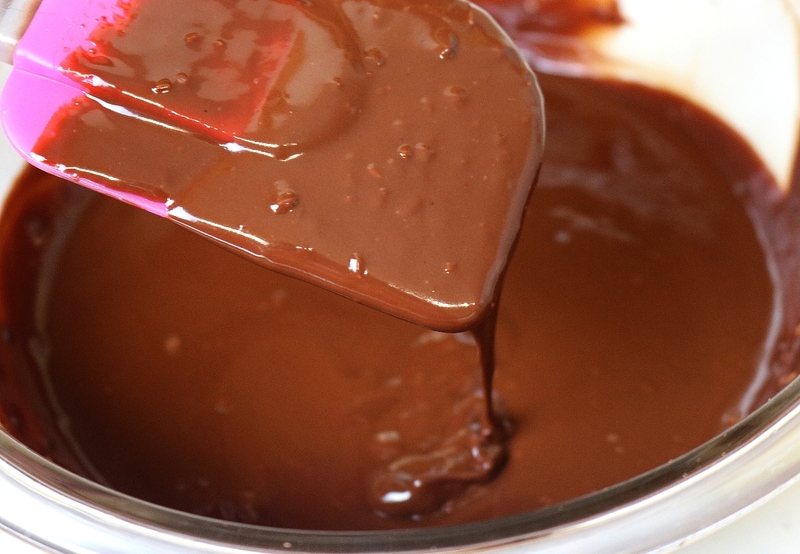 Add virgin coconut oil and let sit for a few minutes as the chocolate melts. Stir to combine. Add coconut extract or flavor and whisk until fully incorporated. Let cool until thick but not hard. Scoop into a piping bag. Stirring the chocolate coconut ganache — note the chunks of toasted coconut! 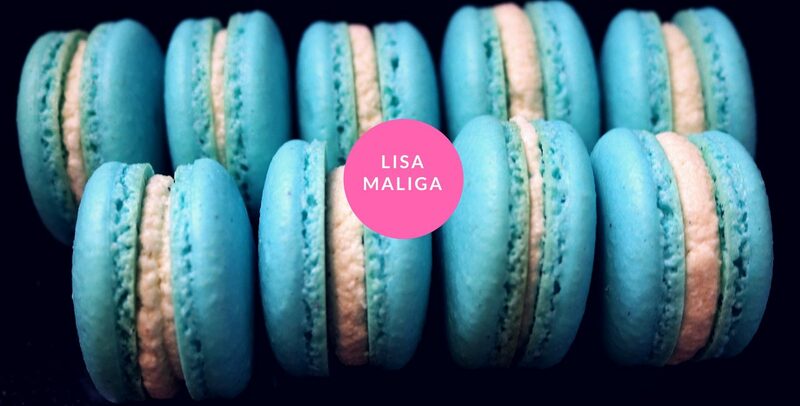 Want to learn more about baking macarons? 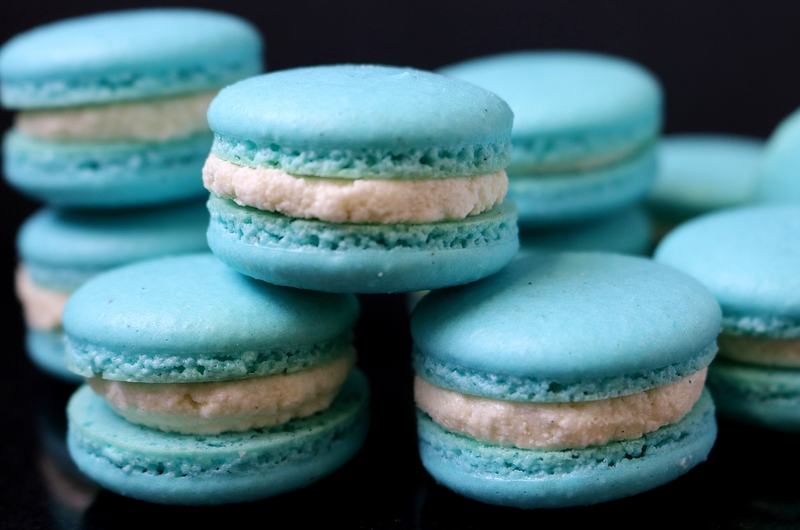 This recipe is from the book Baking Macarons: The Swiss Meringue Method. For cinnamon lovers. Whether you adore cinnamon during the Christmas season or any time of the year, these sweet and spicy macarons are sure to please. Sift almond flour and confectioners’ sugar together into a bowl. Stir in the arrowroot powder and cinnamon, and set aside. Put a template on a baking sheet and place a silicone mat or parchment paper over it. Set aside. In the bowl of a stand mixer, add egg whites and confectioners’ sugar. Whisk until well combined. Place bowl over steaming pot with just enough water, as you don’t want the water touching the bowl. Heat on medium heat until it steams. Test to make sure it’s hot enough by sticking your clean finger in the meringue near the center of the bowl. If using a candy thermometer the temperature should be about 130 F.
Remove from heat and place bowl back onto stand mixer. Add the cream of tartar. Whisk on medium to high speed until firm peaks form. Egg whites should be glossy and if you flip the bowl upside down, nothing will come out. Add vanilla bean paste and whisk for a few seconds. Remove the whisk and add the paddle attachment [if using one]. Add the presifted almond flour and confectioners’ sugar mixture. Turn mixer to low or medium speed and mix for up to 10 seconds. If that doesn’t mix the batter thoroughly, mix for another 10 seconds. Turn off mixer and with your spatula, run it around the sides and bottom of bowl to make sure all the dry ingredients are incorporated. Test for the ribbon stage. The batter should fall back to the bowl as one continuous stream and create a ribbon pattern. Pour batter into a large pastry bag fitted with a large round tip. Pipe onto the silicone or parchment covered baking sheets. When finished with each sheet, bang baking sheet on counter to remove air bubbles. Let shells rest in a cool, dry area for about 30 minutes. To make sure they’re done, gently touch the edge of one with your finger. There should be no trace of batter on your finger. Bake for 15-20 minutes. This will vary depending on your oven. Carefully monitor the baking process and check your oven thermometer. After 8 minutes, rotate the tray to ensure even baking. 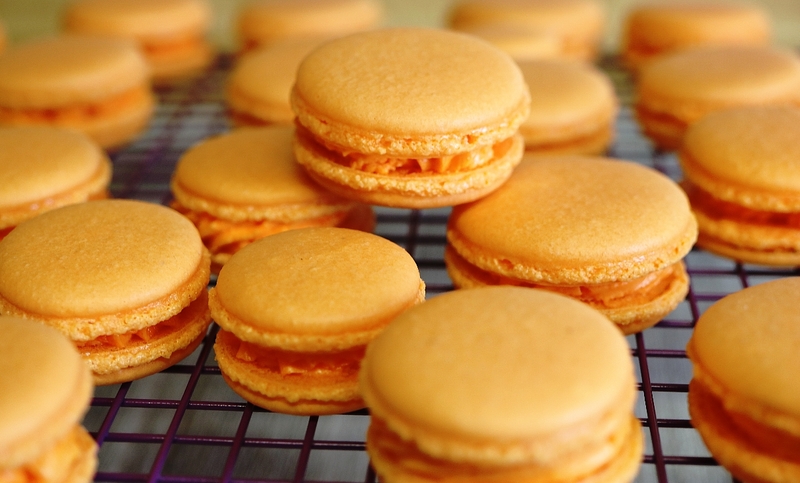 Macarons are done when you peel back the mat or parchment paper and the shells don’t stick. Remove from oven and slide the parchment or silicone mat onto a cooling rack. Place macaron shells on a wax paper covered baking sheet or tray for filling. 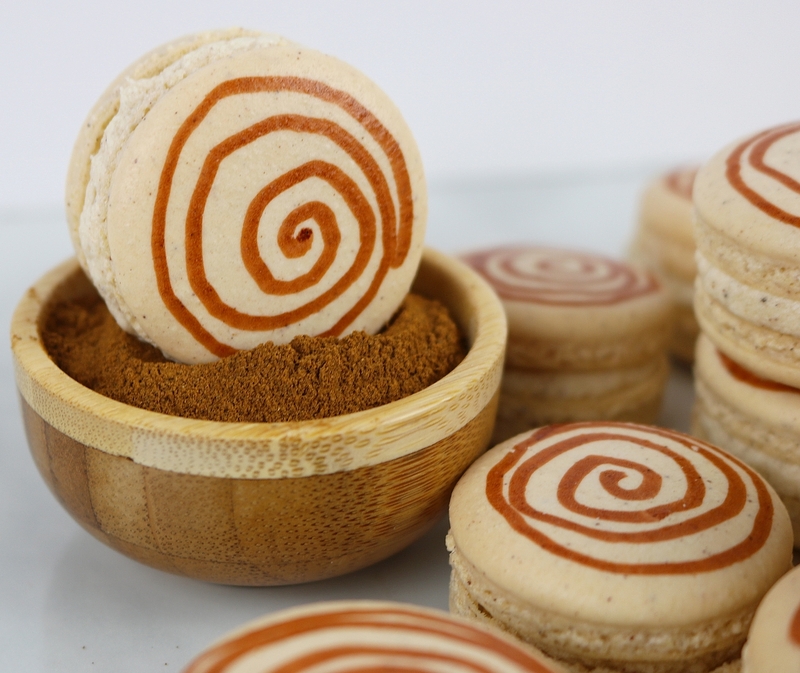 Using an edible brown food color gel pen, carefully draw spirals on each shell. When the shells are dry, match similar sized shells together. Pipe the filling on the flat side of one shell and gently place the second shell on top. In the bowl of a mixer/stand mixer, mix butter and cream cheese until well blended. Add the vanilla, heavy cream, and cinnamon. Continue to blend until well incorporated. Add the sugar and mix on high speed for a few minutes. Spoon into a piping bag and fill your macarons. Baking Macarons: The Swiss Meringue Method covers the simple techniques you’ll need along with the best type of equipment you should have to bake lovely macarons. You’ll also learn how the weather makes a difference, why you should invest in a digital kitchen scale and oven thermometer. I’ve spent lots of time, money, and hard work to get these recipes right. They are all unique and some are more suited to those who like their macarons sweet and others who enjoy their macarons with a little less sugar and are more classically flavored. The Swiss method is for any level of baker providing you carefully read each recipe thoroughly along with the helpful suggestions. When you have the ingredients weighed and sifted, the egg whites separated, and the baking trays lined, it’s time to bake macarons, Swiss style. This unique cookbook is designed for bakers of all levels. 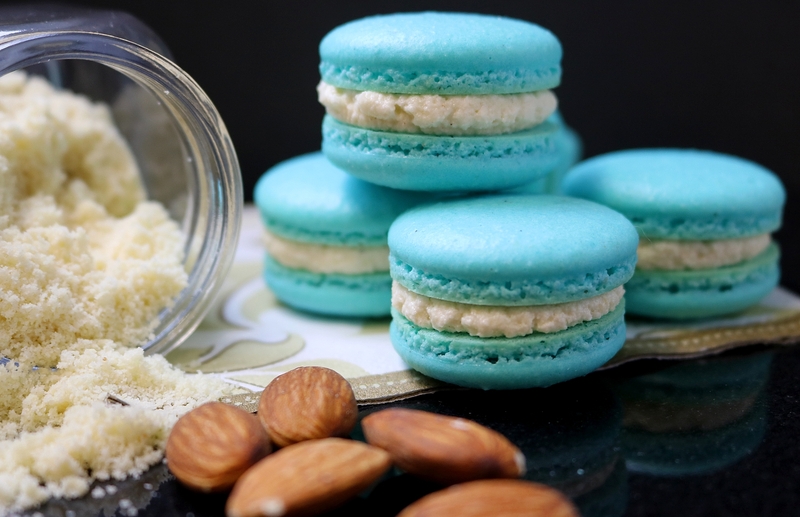 Follow each carefully detailed recipe and bake stunning macarons that will impress any dessert lover. Helpful information includes the best ingredients and equipment to stock your kitchen, resources, tips and troubleshooting, plus the easy macaronage technique that will save you time and energy. With a photo of each recipe, Baking Macarons: The Swiss Meringue Method, offers everything you need to bake beautiful and delicious macarons. It features 20+ new tried-and-tested macaron recipes. Some of the flavors include Minty Chocolate, Speculoos [Cookie Butter], Raspberry Cheesecake, and Apple Spice macarons. Available at these fine bookstores. 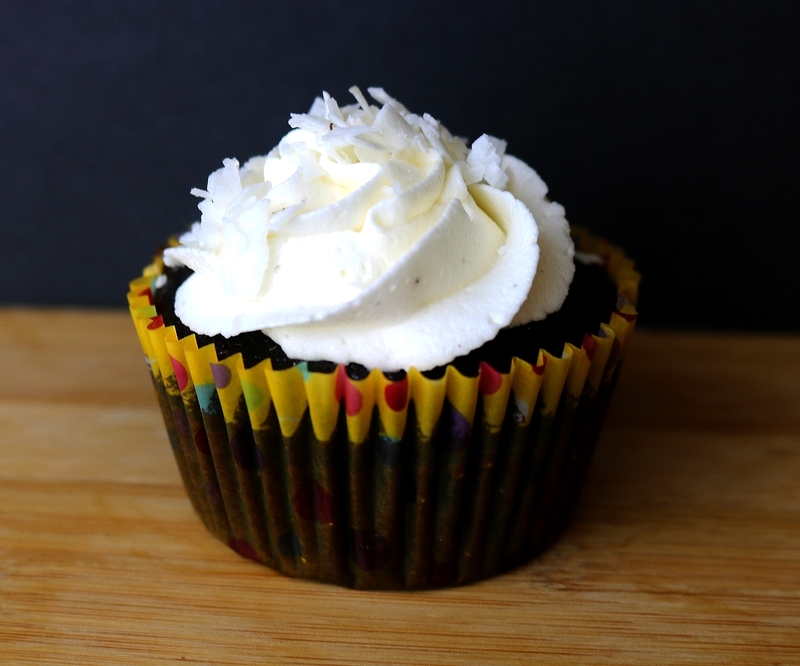 Get ready for any holiday or happy event with these delectable blue cupcakes topped with yummy cream cheese frosting. 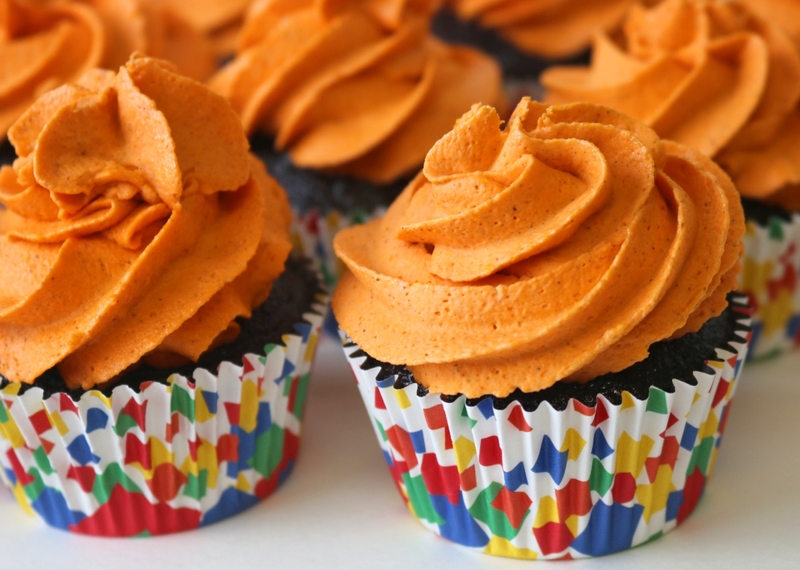 This recipe is from the book Baking Chocolate Cupcakes and Brownies: A Beginner’s Guide by Lisa Maliga. This recipe has a slightly different color than the one featured in my book as I used another brand of gel food color. If using AmeriColor food gel, you’ll only need to add several drops rather than an entire bottle of conventional gel coloring. The color of these cupcakes turned out to be turquoise rather than sky blue. In a large bowl cream together the room temperature butter and granulated sugar. in a small bowl mix 1 tablespoon cocoa powder and blue food coloring. when thoroughly mixed add to the large bowl and mix well. Add the flour, salt and buttermilk alternating between the two ingredients so you don’t get any lumps. In the small bowl, add the baking soda and vinegar. They’ll react together by fizzing up. Add to the large bowl, mixing well. Bake on center rack. Rotate pan midway through baking. Beat softened butter and cream cheese on medium speed for about 3-4 minutes until completely smooth and creamy. Add the confectioners’ sugar and vanilla with the mixer running. Increase to high speed and beat for 1 minute. Add the lemon juice and beat until thick and creamy.